High occupancy/toll (HOT) lanes typically vary tolls charged to single occupant vehicles, with the toll increasing during congested periods. The toll is usually tied to time of day or to the density of vehicles in the HOT lane. The purpose of raising the toll with congestion is to discourage demand sufficiently to maintain travel speeds in the HOT lane. However, it has been demonstrated that the HOT toll may act as a signal of downstream congestion (in both general purpose (GP) and HOT lanes), causing an increase in demand for the HOT lane, at least at lower prices. This paper develops a model of lane choice to evaluate alternative HOT lane pricing strategies, including the use of GP density, to more accurately reflect the value of the HOT lane. In addition, the paper explores the potential effect these strategies would have on the HOT lane vehicle share through a partial equilibrium analysis. This analysis demonstrates the change in demand elasticity with price, showing the point at which drivers switch from a positive to negative elasticity. We can look at the congestion costs imposed [link]. We can allocate infrastructure costs [link]. We can assess full costs to consider internal costs, subsidies, and externalities [link]. This post looks at the idea of road rent. At the margins, what is the value of road space, and how might that cost look on a per vehicle-km traveled basis? Land has value. Land used as roads has value both as a road and potentially for other uses. What if the value for other uses was higher than that for use as a road? In Greater Sydney land values range from to $AU210,000 per m² in Barangaroo on Darling Harbour to under $AU1000 per m² in Western Sydney [link]. In Minneapolis, we estimated a few years ago that average assessed land value as $144 per m² for roads and $30 per m² for highways. [Junge, Jason and David Levinson (2013) Property Tax on Privatized Roads. Research in Transportation Business and Management. Volume 7. pp. 35-42.] It seems that assessed value is about 2/3 of market value in Minneapolis. In some places it is much higher, in some places much lower, the examples used herein are simply an illustration. The idea is that there is land holder (such as a government land agency) that has to decide whether to allocate land to road uses or for other purposes. Consider the implications if property taxes were reduced by up to $88M in total, and parking permits sold at $400/year (payable monthly with the water and trash bill). People would realize the cost of on-street parking, and there would be less of it, and less vehicle ownership at the margins, and fewer trips by car. Space freed up could be re-allocated. Alternatively, $400 per year is the value of public subsidy from publicly-owned land to private car owners who get `free’ on-street parking. In short from the car-less to the car owners. The economic idea of opportunity cost is important here. Opportunity cost is value of the next best alternative. The next best alternative to road space might be renting it out. So for instance an urban US freeway that destroyed blocks of extant development when it was built has an opportunity cost associated with the value of that real estate. The last item deserves some discussion. Consider that our road with two parking lanes (one on each side) is maybe 10 or 12m wide (~32 to 40ft). This is wider than some houses are long. The city could in principle retain the sidewalks and sell off the roadbed for townhouses or single family homes. Given the houses are already serviced by alleys, and so long as not all roads were sold off, some roads could be. An illustration of this is the Milwaukee Avenue in Seward in Minneapolis, as shown in the figure. You will see there is no paved street in front of the houses. This could be tightened up further or realigned should there be demand. This is not appropriate for every street. However, (1) there are places this can be done, where roads are in excess and housing scarce, and (2) this illustrates that land currently used as asphalt to store and move cars has value, and that houses have value even in the absence of streets for cars in the front. There are always excuses — utilities may need to be relocated, fire trucks would need to go slower down narrower sidewalks. But these excuses can be overcome, there are numerous examples of narrow paths that function as roads. Typically each car is in use 1 – 1.5 hours per day, and parked for the remainder. In the previous section, we considered parking, the `remainder,’ in this section we look at the time in motion. When in use, the car is occupying not simply its area (the 10m² = 2m x 5m), but also is preventing the use of other space around it. On a freeway with a capacity of 1800 vehicles per hour traveling at a freeflow speed of 100 km/h, (i.e. just before the speed and flow drop due to congestion sets in) there is a critical density of 18 vehicles/km. 18 vehicles per km is 55.5 meters per vehicle. Lane width is 3.65 meters, so the area occupied is 202 m². Let’s round to 200 m². Each moment a car is in use, it is using 200 m², on which it should pay rent. So for an hour a day, this is 720,000 m² s or 72 ha s. (The meter-squared by second (or hectare second) is a new unit of measurement (a time-volume) that needs a catchier name). It is the density that is the relevant number here, since vehicles are occupying space that we are charging rent for in this thought experiment. Though they are moving, and so the space they are occupying moves with them, there is always some space being occupied for the duration of their travel. Each of those vehicles per hour is occupying a moving window of space. When roads are less congested, cars are consuming more space per vehicle. So uncongested urban are much more expensive per traveler than congested rural roads. When traffic breaks down, they are consuming less space, but presumably are occupying that space for more time, since they are going slower. Induced demand [link] and travel time budgets [link] negate that to a significant extent. Illustration of space occupied by cars. Note that most cars do not have 2 occupants. This particular layout is, surprisingly, in somewhat congested conditions. Cars often take up more space at higher speeds. Screen still from a 2002 Saturn car company TV commercial. Image source: The San Francisco ad agency Goodby, Silverstein & Partners. Article: Raine, George ‘Goodby, Silverstein agency celebrates 25 years’ SF Chronicle. In this example, the hourly rent on 200 m² is what we are interested in. Though cars move, over the course of 1 hour of travel in these conditions, they are claiming that much space. The specific space they are claiming moves with the vehicles, but this all balances out as other cars claim the space they vacated. Road section 1 (suburban residential): l=5 km, w=3.65, v=30 km/h, q=1000 veh/h, k=33.33 veh/km, AADT=10,000 vehicles/day/lane, p= $1000/m². Road section 2 (motorway): l=10 km, w=3.65, v= 100 km/h, q=2000 veh/h, k= 20 veh/km, AADT = 20,000 vehicles/day/lane, p= $5000/m². Road section 3 (downtown): l= 1 km, w=3.65, v=40 km/h, q=1600, k =40 veh/km , AADT=16,000 vehicles/day/lane, p= $10000/m². This annual rent is paid by the road agency to the land owner for the use of land as a road. The road agency then wants to recover this cost from its customers, the travelers. The question of how to allocate always has some subjectiveness to it. Another way of thinking about it is based on elasticity of demand. Peak hour work trips are perhaps the least elastic (least sensitive to price), and so from an economic efficiency perspective should bear the greater cost. In this example, we take a simpler tack. The total is thus $529.25/year or $1.45/trip to cover land rent. `Your mileage may vary,’ as the saying goes. The implications of this are several. At an additional $1.45/trip, travel by car (and congestion) will diminish. Road rent is essentially additive with annualized infrastructure costs, which generally does not consider the cost of land (rather, land is often implicitly considered `free’ or a sunk cost). If travel by car diminishes sufficiently, road space can be clawed back and redeployed for other public purposes. Narrower lanes impose less road rent. But not necessarily proportionately so, as the throughput on narrower lanes (with human drivers) may be lower as drivers are less keen to be immediately adjacent to nearby high-speed vehicles. Slower moving vehicles take up less space, but take that space for longer. While pedestrians and bicyclists use space as well, they use much less space. (See discussion of flux.) Sidewalks (footpaths) are often considered part of the adjacent private property, and are thus already paid for with property tax. Land used for roads instead of development is not on the books for property taxes. The revenue raised can be used for many transport purposes or redistributed back to taxpayers through some other means. We expect the additional road rent reduces the effective land rent that landowners can charge. If people have to pay more for travel, they will pay less for real estate. Rural areas have much lower, perhaps negligible, road rent. Though the number of users drops significantly (so there are fewer travelers who must pay the burden of road rent), the cost of land drops even more significantly. Were there no (fewer) roads, land would also have very little (less) value, since it would be difficult to access and egress. If roads were fully built on, views would be terrible and the existing buildings would diminish in value. But none of that is to say we have the correct amount of roads now. Clearly urban roads are undercharged in a real estate sense. The onset of High Occupancy/Toll (HOT) or express lanes is already happening across the US (Figure 13.1). Whereas road pricing requires everyone to pay for use of the facility, HOT lanes allow users to opt into paying a toll in exchange for assurance of uncongested travel (or travel for free or a discount if they are in a carpool). We foresee more HOT lane networks running adjacent to most urban freeways in the US, shaving some time off for those who chose to pay. HOT Lanes are compatible with road pricing systems that do not entirely eliminate congestion, as they provide higher reliability (just as FedEx offers alternative rates for same-day, overnight, and two-day delivery). 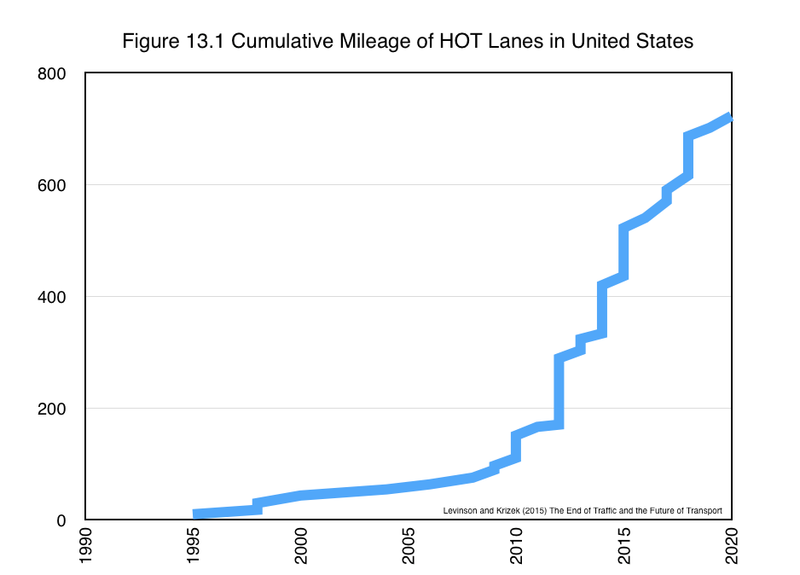 HOT Lanes will also be important because they are likely to be the first roads to be entirely automated. Given their isolation from other lanes and the premium price, they can be automated much sooner than other roads, which will continue to serve mixed human and automated traffic for at least another decade past the onset of select lanes for automated cars. Figure 13.1, Sources various. Special thanks to David Ungemah and Mark Burris. This paper presents the results of an investigation into the factors contributing to toll lane subscription choice by using data from the MnPASS high-occupancy toll lane system operated by the Minnesota Department of Transportation. The paper estimates a binomial logit model that predicts, on the basis of aggregate characteristics of the surrounding area, the likelihood of a household having a subscription to MnPASS systems. 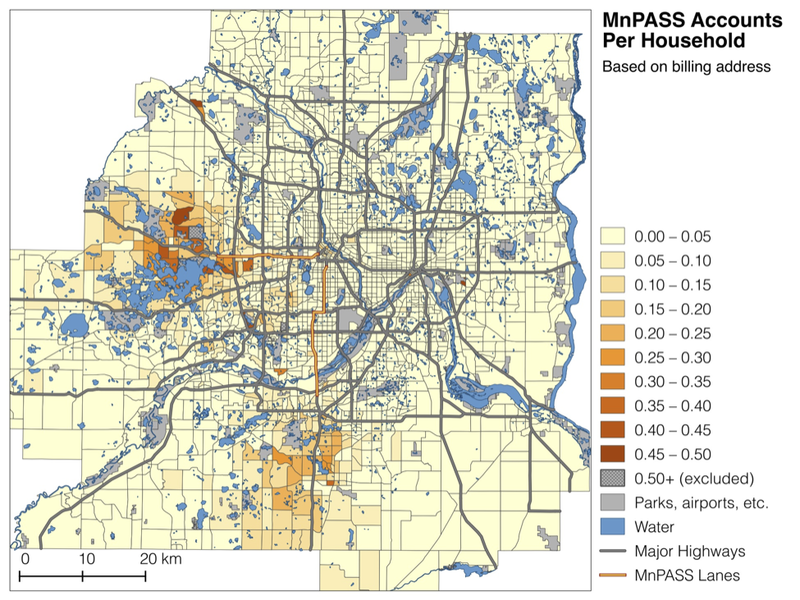 Variables in this model include demographic factors as well as an estimate of the incremental accessibility benefit provided by the MnPASS system. This benefit is estimated with the use of detailed accessibility calculations and represents the degree to which a location’s accessibility to jobs is improved if HOT lanes are available. The model achieves a rho<sup>2</sup> value of .634, and analysis of the results suggests that incremental accessibility benefits play a statistically and practically significant role in determining how likely households are to hold a toll lane subscription. Construction closes road. Neighbor opens bypass. Govt. upset. An opportunist businessman yesterday opened a new private toll road across fields around the site of a closed main road – but council chiefs have advised drivers not to use it. The 400 metre stretch of road has been laid around the spot on the A431 between Bristol and Bath which has been closed since February, and will cost car drivers £2 to use. The road, which does not have planning permission and has not been given safety certificates, re-opens the A431, which is an important ‘back road’ between Bath and Bristol to the north of the River Avon, and massively used by commuters between the two cities.